This is definitely a book that you will want to buy spare copies of to give to your friends. 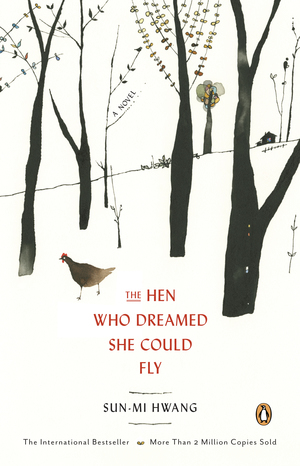 A South Korean fable by Sun-Mi Hwang, it tells the story of Sprout, a hen whose sole purpose in life is to lay eggs. She is an egg machine. From her coop she watches the hens and ducks in the yard with their babies, and longs for a chick of her own, to cuddle it and take care of it, sleeping safely in the warm barn at night. Then one day she realises she will never have her own chick because the farmer takes all her eggs. Her motivation to eat disappears, she becomes eggless, scrawny and weak and so is culled from the coop. I loved Sprout, she is a brave female heroine who shows the bullies that they cannot beat her. Like all fables, there is a message. This story warns against watching what others have and thinking they have it better than you do. Sprout longs for the greener grass, but when she finds herself living in that green grass she learns the realities. It is about being brave, about being proactive, about getting out there and making something of your life even if people tell you it will never happen. Along the way it also deals with motherhood, adoption, racism, prejudice and rejection, but it is a simple story to read. She is, after all, a hen. Suitable for all ages, it’s one of those books that has a narrative for children and adults alike. The line drawings, which illustrate each new chapter, are beautiful too. A gem of a little book.